Top the aubergine with tomato slices. Bake for 15 minutes. Mix together the rest of the ingredients along with 2 tbsp cold water to make a pesto. Season. 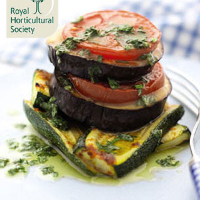 Layer the cooked vegetable slices into 2 stacks and then drizzle with some pesto.